Higher education is an increasingly global enterprise and UK universities need to address international competition for business, research funding and students according to a report released by HESA today. The report, International Benchmarking in UK Higher Education, was commissioned as part of a HESA project Realising Business Benefits through the use of Benchmarking. A sample survey of planning officers at UK universities, conducted during research for the report, revealed that the international outlook of institutions varies widely. Some institutions routinely compare themselves with international competitors in terms of research performance. Many others confine their assessment of international standing to comparisons of international performance measures with their domestic UK peer institutions. The report finds that there are dangers for UK universities if they continue to frame and benchmark their international performance and academic operations only against their domestic peers. World-class standing must be demonstrated based on evidence from international competitors. The report recommends that institutions make better use of the available range of information resources and collaborate in developing internationally focused benchmarking initiatives. Today's report includes a detailed listing of the available international information resources and finds that traditional views on the shortcomings of these resources should be reassessed. The report concludes that, more than ever before, UK higher education institutions need to have a global perspective. Students, research funders and businesses have a global choice and UK institutions will need to show that they are ‘world-class'. Well-targeted international benchmarking can offer insights that will be crucial to their success. The full report International Benchmarking in UK Higher Education is available online from the benchmarking project microsite . 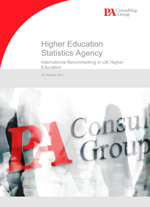 Today's report, International Benchmarking in UK Higher Education was commissioned by HESA from PA Consulting Group as part of the follow-up to the HESA Status Report Benchmarking to Improve Efficiency. The report presents a snapshot of current international benchmarking activities and experiences in the UK sector, provides an overview of the range of benchmarking resources available, and offers proposals for future approaches to meeting HE institutions' needs in this area.